Hoop Nut #PBA #PBA2016 2015-2016 PBA Philippine Cup Alaska Aces Alex Compton PBA PBA Finals San Miguel Beer #PBA2016 Philippine Cup Finals: Alaska's 3 Timeouts - Gimmick or Game Plan? #PBA2016 Philippine Cup Finals: Alaska's 3 Timeouts - Gimmick or Game Plan? It has been three days since the 2016 PBA Philippine Cup Finals ended after an epic and historic Game 7 where San Miguel Beer escaped the Alaska Aces. The Beermen became the first team in the PBA and NBA (I'm not sure about other international basketball leagues) to comeback from a 0-3 deficit and win the next four games. The actual game provided vasts amounts of entertainment. San Miguel led early and Alaska tried to catch them but the Aces fell short with their rally. It was a good game but most people talk and debate about what happened at the very beginning of the game. So what happened? Alaska Coach Alex Compton called 3 consecutive timeouts at the 11:59 mark of the 1st quarter. I was watching this unfold. I was surprised that ONE timeout was called that early because Alaska did not have difficulty throwing the ball in bounds from the sideline. Next, when things seemed fine, Alaska called their SECOND timeout and to make things even more bizarre, they called their THIRD timeout right after. I was dumbfounded at that moment. I have never seen anything like that in all the basketball games I have played and watched. Even Coach Tim Cone (guest TV analyst) stated that he does not understand what was happening. Alaska was trying to protest something. What exactly? I'm not sure. My best guess was that they felt the series was being officiated unfairly once the Aces went ahead 3-0. Compton blasted the discrepancy of fouls and free throws given to SMB during Game 5. In that game, Alaska had 5 FTs compared to SMB who had 35 FT attempts. June Mar Fajardo had 10 FTs just by himself. Furthermore, maybe Alaska felt that the league was favoring SMB or there was a mandate to stretch the finals to 7 games to make more money for the PBA. The next idea involves the mental aspect of the game. I think the Aces tried a psychological warfare (psywar) technique vs the Beermen. The momentum was on SMB's corner and the adrenaline from them was overflowing so Compton tried to change those through the use of early timeouts. 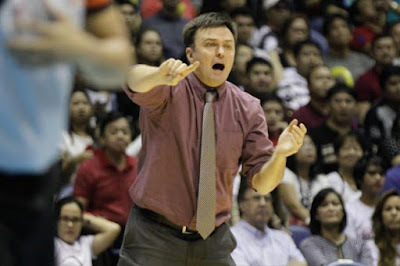 I think Compton was hoping that the Beermen might lose their focus or get frustrated with the early stoppage of play. Or SMB might start poorly and slowly because the game got disrupted. If that was the goal of Alaska, it did not work to its full extent because SMB raced to an early lead and was up 22-16 after 12 minutes. It can be argued that the 3 timeouts slowed down Alaska instead of SMB. The last idea seems the most logical and realistic reason. Alaska used their mandatory timeouts so that the game will not have required breaks later on. Thus, Alaska would try to run more often and use full court pressure defense to get the Beermen more fatigued. Less timeouts would mean fewer chances for SMB to rest and take breaks. That could also possibly ruin the rotation patterns of SMB. However, since Alaska used their mandatory timeouts, that meant that they could not use them when needed. When would Alaska need to call a timeout? There are certain scenarios when a timeout is needed: to stop San Miguel's scoring run, to rest or substitute their own players and to save a possession when in trouble. While this idea seemed the most plausible one, I think this also backfired on Alaska because timeouts are needed for specific situations and not supposed to be burned early when all players are rested. Overall, the timeout strategy was either a failed gimmick or a wonderful game plan by Coach Compton. Since Alaska lost, the burned timeouts appeared gimmicky. If Alaska won, then his timeouts would have been a genius move. In post-game interviews, Compton did not reveal the real reason behind his tactics. Maybe we will see it again in the near future and if Alaska wins that game, maybe Compton will finally tell us his reasoning. I would really love to know why he called those timeouts. How about you?